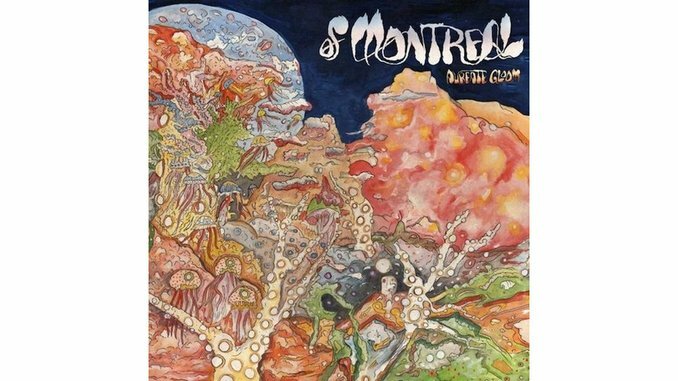 It’s comforting knowing that regardless of what’s coming down the popular music pike, whatever trends and fleeting incongruences in fashion or style, every year or so of Montreal is going to release a new full-length of mind-bending glam-punk decadence that sort of blows everything else away. On his latest collection, of Montreal maestro Kevin Barnes expands upon the trippy-dippy groove of 2013’s excellent Lousy With Sylvianbriar, sandwiching bold first-wave punk affectations and anthemic fist-pumpers into his alternately glittery/gloomy oeuvre. But it’s Barnes’ verbose dear-diary lyricisms, not his topical texts, that propel a majority of the tunes on Aureate Gloom, even with the spectrum-spanning moods and genres he’s fond of exploring. Weaned as it is on the Greenwich Village of the ‘70s, summoning the musical mojo of Lou Reed, Tom Verlaine, Patti Smith and Richard Hell, Barnes dutifully pays homage while remaining hyper-vigilant to his own unique vision. “Empryean Abbatoir” flows with a barebones bass-chord progression set to a four-on-the-floor percussion, floating Barnes’ journalistic talents in one of the sparsest moments on any of Montreal recording to date. That’s short-lived, however, as even the delivery of burnt-out lines like “You made my sky a graveyard and my moon a funeral” can’t deter the eventual opening-up of the tune to a raucous punk finale. In contrast, the Bowie-esque lilt of “Aluminum Crown” comes awash in white-noise atmospherics as if a zero-gravity Barnes is singing inside Major Tom’s spacecraft. As was the case on Lousy, Barnes and the current incarnation of of Montreal? drummer Clayton Rychlik, bassist Bob Parins, guitarist Bennett Lewis and keyboardist JoJo Glidewell?recorded straight to tape, bottling the stage-tight energy of the band’s live sets into a breakneck session in a border town Texas desert studio. The result is an audacious delight, delivering aural odysseys that slither in and out of the territory of heavy-lidded dance-club bangers, junkie-punk ragers, symphonic Baroque-pop gems, plaintive guitar-rockers and myriad lessons from the Marc Bolan school of glam-rock depravity. Aureate Gloom has all that, and potentially many more folds that a mere 20-plus listens cannot possibly detect. Such is Barnes’ genius, and thusly another of Montreal album triumphs.